With The Charity that Began at Home, the Shaw Festival presents the last in a series of three plays that St. John Hankin (1869-1909) published under the ironic title Three Plays with Happy Endings (1907). As with the other two plays in the series – The Return of the Prodigal (1905) seen here in 2001 and 2002 and The Cassilis Engagement (1907) seen here in 2007 – the play is directed by Shaw Festival Artistic Director emeritus Christopher Newton and is flawlessly acted and beautifully designed. While Hankin subtitled Prodigal “A Comedy for Fathers” and Cassilis “A Comedy for Mothers”, he subtitled Charity “A Comedy for Philanthropists”. In all three cases the “comedy” turns out to be quite a bitter one for its dedicatees. Charity confirms the uniqueness of Hankin’s style that I noted in Cassilis – a style “halfway between the brittle wittiness of Oscar Wilde and the social satire of Shaw but shot through with the kind of melancholy one finds in Chekhov that gives the comedies unexpected depth”. Both Prodigal and Cassilis pitted the older generation against the younger. In Charity the source of contention is much more general and finds both the older and younger generations working together to conduct a flawed idealistic social experiment. l will emerge only if every person, even the most loathsome, is treated with kindness. To that end the two women have invited five people they have come across who for various reasons from personal abrasiveness to criminal conduct have been excluded from society. Not only that, but Lady Denison has followed Hylton’s principles in hiring her servants. She deliberately hired her new butler Soames (Andrew Bunker) because his previous employer would not give him a reference. Lady Denison feared Soames would fall into further dissolution if she did not help he, but now three of her previously faithful servants threaten to give notice because of Soames’ ungentlemanly behaviour. 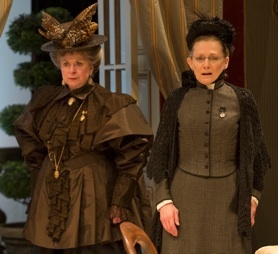 Events reach a climax when one of the social exiles Hugh Verreker (Martin Happer) proposes to Margery and she accepts, much to the consternation of Lady Denison, her sister-in-law Mrs. Eversleigh (Laurie Paton) and Hylton, who is obviously in love with Margery. Margery’s reason for accepting the penniless Verreker is Hylton’s own – that people have a duty to help reform others who have fallen into bad ways. Margery thinks that marriage will give her a full lifetime to devote to reforming Verreker. Philanthropy gone overboard is clearly the object of Hankin’s satire, but the satire is not black-and-white. Hankin’s superficially simple plot has numerous complex resonances. Hankin’s ultimate question is whether there is a limit to being kind to one’s fellow human beings and where that limit lies. This is not at all an easy question. When do we stop believing that there is some good in everyone? After only one mistake? After two? The subject has up-to-the-minute relevance since so many have pointed out the unfairness and harm done by the three-strikes-you’re-out laws in the US. The implications of Hankin’s plot are even wider. Hylton says, “Usen’t we to be taught that it was our duty to love our enemies?” to which Mrs. Eversleigh responds, “Yes. But only on Sundays. And no one ever dreamed of doing it.” With this kind of exchange Hankin expands his satire to the foundations of Christianity and all other religions where charity, along with faith and hope (see 1 Corinthians 13:13), are held to be essential virtues. The more one examines Charity the more one sees how radically Hankin undermines the basis of social, political and religious liberalism. Yet, there is a final twist. The conclusion Hankin gives the play actually proves Hylton’s thesis by showing that there is good in the soul of the least good of the five guests. But it is that truth, not the character’s wickedness, that ironically leaves one of the three do-gooders completely shattered at the end. All these complex implications roil beneath the surface of what seems an innocent parade of British eccentrics gathers for a country house party. Hankin’s technique is to thrust us right into the middle of the fray with the arrival of the five social exiles along with Mrs. Eversleigh and Hylton. Mrs. Denison calls herself forgetful and seems slightly dotty while her daughter seems too idealistic to be true. Thus, before we get an explanation who these people are and why they are here, Hankin leaves us to decide who are the odd people out since no one on stage appears quite “normal”. The gathering of this human menagerie culminates in a tea party which is a madder tea party than anything in Lewis Carroll. In an exquisitely directed and acted scene all the characters are speaking at once in various groups. Despite what could easily be utter chaos, Newton has so orchestrated the party that through the ebb and flow of each of the conversations, we know exactly what each group is saying. This tour de force of acting and direction is on par with the great dinner party scene in Lillian Groag’s The Magic Fire (1997) that Jackie Maxwell directed here in 2006. This single scene is so impressive it is reason enough to see the play. Nevertheless, the production has many more virtues that demand recognition. For one, its casting is well nigh ideal. Fiona Reid creates an hilarious portrait of Lady Denison, who has so long left decisions to her daughter that she is now virtually incapable of deciding anything. Rather than presiding confidently over her own house, she soon becomes prey to her bizarre guests whims and can only convey her embarrassment or outrage through a series of priceless facial expressions. Reid’s character could not survive the house party at all were it not for the presence of her imperious sister-in-law Mrs. Eversleigh. 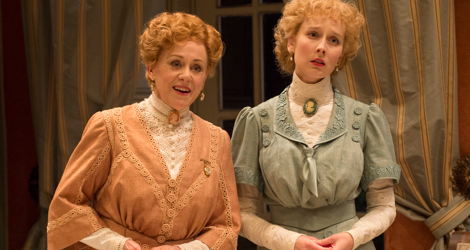 Laurie Paton makes us see that Eversleigh is the only completely sane, commonsensical person in the household. It would be easy for Paton to allow Eversleigh’s constant criticism of the poor decisions of Lady Denison, Margery and Hylton to become monotonous, but Paton carefully avoids that by gradually escalating Eversleigh’s tone of outrage and modulating her means of expressing it from light criticism to unbridled condemnation. Paton also gives us the uncomfortable picture of what it is like to be the lone voice of reason in a world that seems to have gone mad. Her flashing eyes show anger but with an anxious glint of desperation. Julia Course gives one of her strongest performances yet as Lady Denison’s daughter Margery. Course plays Margery as a young woman whose personality is poised halfway between Shaw’s militantly idealistic Major Barbara of 1905 and Wilde’s charmingly unworldly fantasist Cecily in The Importance of Being Earnest (1895). To defend her decision to marry Verreker, Margery throws Hylton’s exact words back in his face which only underlines how Hylton’s theories have destroyed his own happiness. Course’s intensity makes Margery’s decision as painfully believable as a would-be saint’s decision to choose martyrdom. Basil Hylton finds Graeme Somerville in his meek character mode. In fact, Somerville’s Hylton is so self-abnegating it almost begins to look like a mental illness. Hylton’s anger at Margery’s decision to marry Verreker shows us that the young man at least for a moment has recognizable human feelings. But his agonized struggle to accept what Margery has chosen makes us feel that he has as much a sickly desire for martyrdom as Margery. Among the socially awkward, self-obsessed guests, Jim Mezon stands out as the raucous General Bonsor, who mistakenly believes that his interminable biographical stories have any interest other people. Sharry Flett is the frightening German tutor Miss Triggs, whose passive-aggressive nature easily slides into outright aggression when anyone shows her favour. Donna Belleville, in a succession of huge gowns that reflect her overblown personality, as Mrs. Horrocks naturally does not get on with General Bonsor since she feels her claim to be an aristocrat should make her the centre of attention. Neil Barclay finds so much comedy in the pushy salesman Mr. Firket, it’s too bad he inexplicably disappears so soon from the action. Martin Happer gets the superficial charm of Verreker just right along with the character’s absolute imperception that every word he says in his defence only further blackens his reputation. Designer William Schmuck has created a lovely pastel-hued set of absolute symmetry. The symmetry only heightens the unbalanced nature of nearly all the characters. The beautiful gowns he gives Lady Denison and Margery and the suit he gives Hylton tie them to Lady Denison’s domain, while the strong colours of the guests clearly mark them as outsiders. Newton’s direction is so highly detailed that one can learn what a character is saying almost as much by watching the other characters’ reactions as by watching the character who is speaking. In an added irony he has the servant William (Edmund Stapleton), who complained of Soames’s bullying, bully his fellow servant Arthur (Stephen Jackman-Torkoff) in order to court the favour of Lady Denison. Newton’s one false step is to try to make a scene comic that is not. We discover that Lady Denison’s maid Anson (Darcy Gerhart) has been “ruined” by Soames. No matter how many snorts Newton gives the maid in her wailing, the situation is not humorous and neither is Lady Denison’s automatic defence of Soames. Mrs. Eversleigh is rightly scandalized at her sister-in-law’s attitude, which should remind us of Dickens’s Mrs. Jellyby in Bleak House (1853), who spent more time on charity for children in Africa than she did for own children. Here Lady Denison condemns her faithful pre-Hyltonite servant to defend her disturbingly chilly post-Hyltonite employee. This flaw aside, Newton proves yet again what a fascinating dramatist English literature lost in the early death of St. John Hankin. There are only two full-length plays and a handful of one-acters left to perform of his oeuvre. 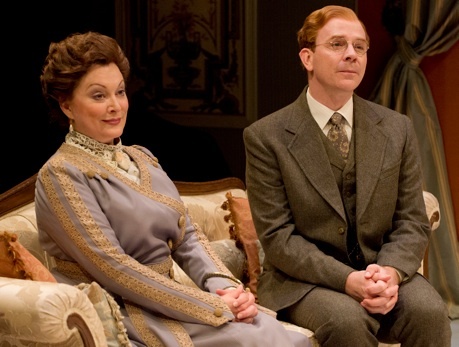 The Shaw’s productions have so enlightened our view of Edwardian drama that one hopes sometime to see them all. Photos: (from top) Fiona Reid and Julia Course; Donna Belleville and Sharry Flett; Laurie Paton and Graeme Somerville. ©2014 David Cooper.